Before we get to Manny Ramirez flying his barber to Boston to cut his locks, let's get one thing straight: Not everything filthy rich folks do is a ridiculous indulgence; some of it is just a luxury. They have to dress themselves for big events on the road, so Beyoncé flies out her personal stylist. They have to cook their own food at home, so Shaq has a personal chef. None of this is unreasonable, if you can reasonably afford it. 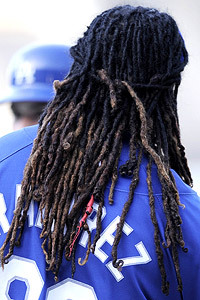 Kevork Djansezian/Getty Images Here's a look at Manny Ramirez's locks as he wore them in April. The same goes for Manny. White Sox owner Jerry Reinsdorf told him he has to cut his locks, and since Angel Pena, aka Monster 99, is usually the dude tending to Manny's hair, Manny wants to bring him to Boston. A little context: Men of color almost always have a personal barber, and the ones with ridiculous amounts of disposable incomes -- such as athletes -- routinely fly them to wherever they are to get cuts. Pena, for example, does this for dozens of other MLB players. We all wish we could do the same. Whenever we're in a city for an extended stay -- because we can't fly our barber to us -- we meticulously seek out a local guy, hopefully by personal recommendation. Then we spend a tense 45 minutes in the chair, carefully explaining to that barber how he's supposed to cut our hair. It's a nonstop restless experience. You sit in the chair, ask for a short 'fro, and just hope you don't end up with a Mohawk. Monster99 cuts David Ortiz's hair, too. 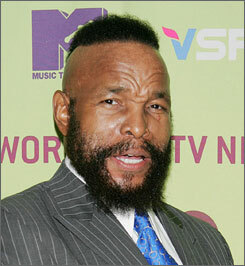 If Papi were to let just anybody give him a trim, he might end up with a Mr. T.
Adding to the routine nature of Manny's barber summoning is the fact that locks are very personal to some men. They take years to grow, and no matter what men might admit, many of us tend to identify with our locks as much as our actual faces. Manny's locks are Manny. He's not going to let some Beantown schmuck shear them. Not even an inch. Because he doesn't have to. He's rich. That's a job for Monster99.